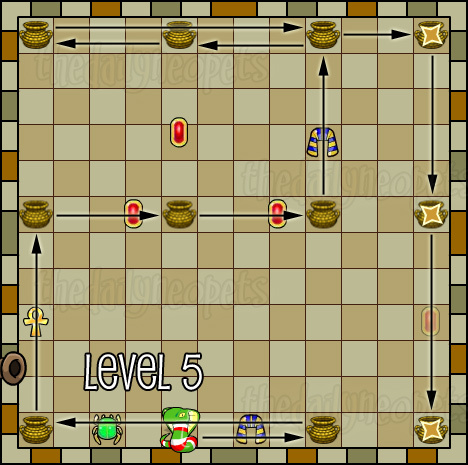 In this nifty little game you play as Jub Zambra from Jub Zambra and the Cobrall Charmers, helping him to guide his Cobralls through ten carpet maze puzzles! 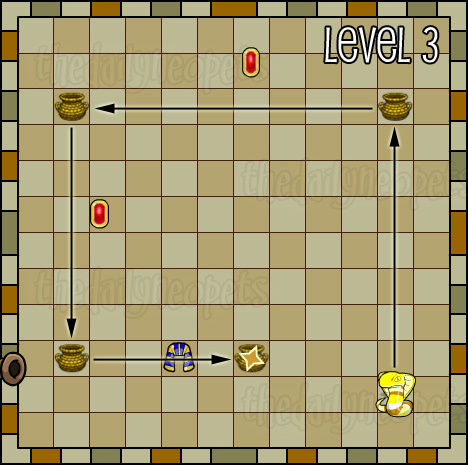 This game is actually incredibly easy - to complete each level all you need to do clear all the baskets from the carpet. 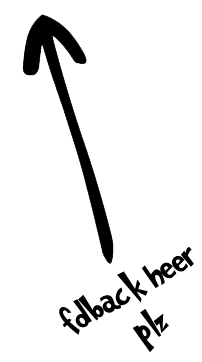 To move your Cobrall click or use your arrow keys in the direction you want it to move. Cobralls can only move horizontally or vertically, and will keep moving along that line until they meet a basket. If there is no basket between your Cobrall and the edge of the carpet the Cobrall will crash and you'll lose a life. You clear baskets by landing on them. 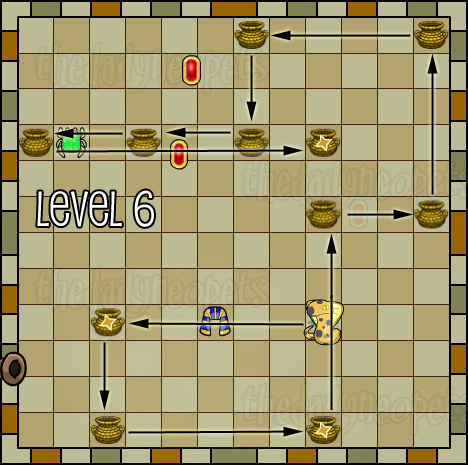 The higher the level, the more baskets you will have to clear. 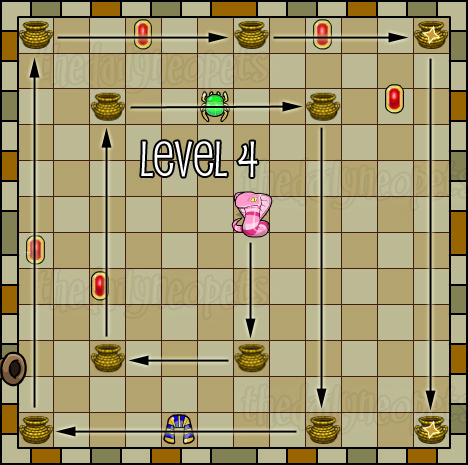 Each basket you clear is worth the same number of points as the level you are on. 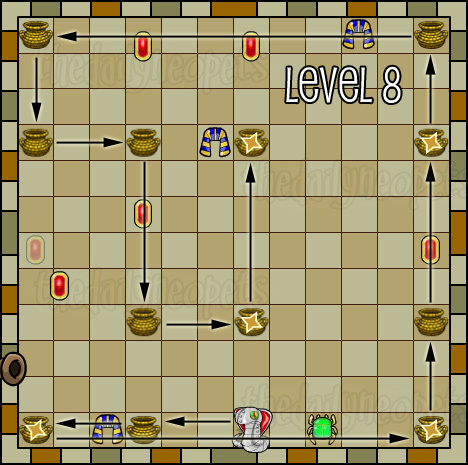 For example, baskets in level one are worth 1 point, level two they're worth 2 points, etc. There are also a few other things you'll want to look out for during the game. Starred Baskets relate to the Star Bonus that you get at the end of the level. This bonus is multiplied by the number of Starred Baskets that you collected last so always try to collect them after you've gotten all the normal ones. 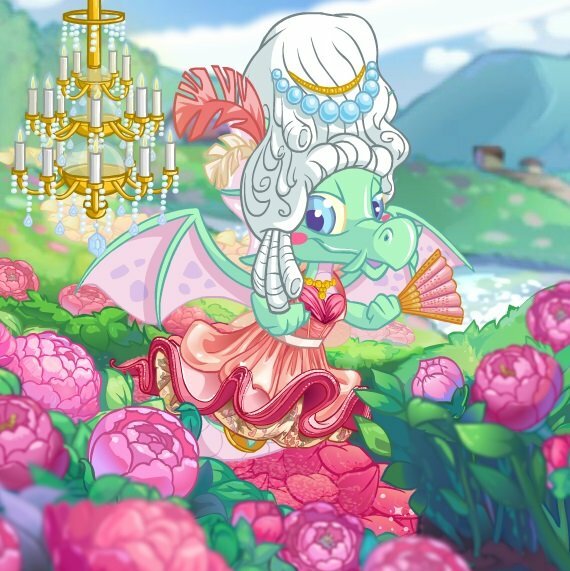 When you collect a Headdress it affects your multiplier. Depending on which one you collected last your multiplier will be either 2, 3 or 4 (its 1 if you don't collect any headdresses). 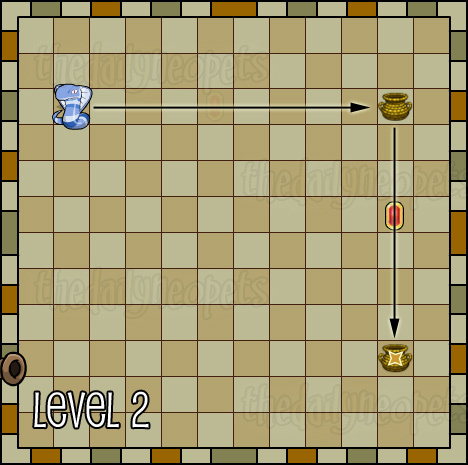 The higher the multiplier, the higher your score will be for that level. Unfortunately there is no way to tell whether a multiplier will be 2x, 3x or 4x before you collect it, and it is possible to override a 4x one with just a 2x one if you collect the lower one second. 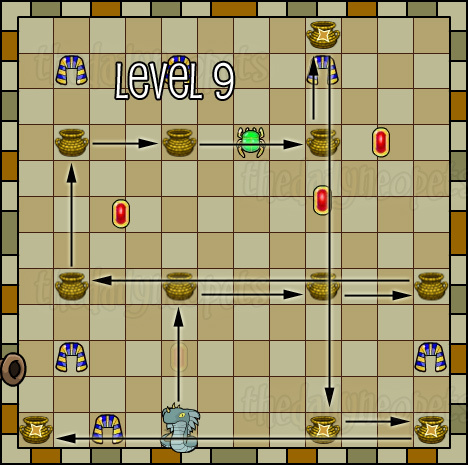 As the levels are always the same however (albeit rotated) once you're played for a bit you'll get used to remembering which headdresses do what to your multiplier. 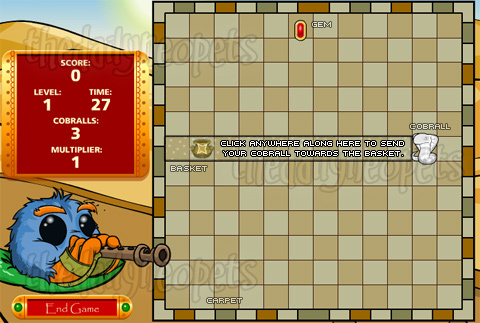 The Gems simply add more points to your score as you collect them. They are worth the same amount of points per level as baskets are, and can be stationary, moving or fading in and out of the screen. If you're going for a high score try to collect all the gems - especially in the later levels, when they're worth more. Scarabs add 5 seconds to your timer when you collect them. 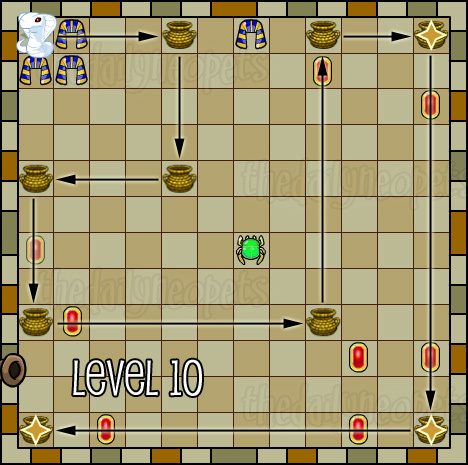 The rarest of the things you can find in the game, the Ankh is also the only one that is never consistently present in any level. When you collect it, the Ankh gives you another life. 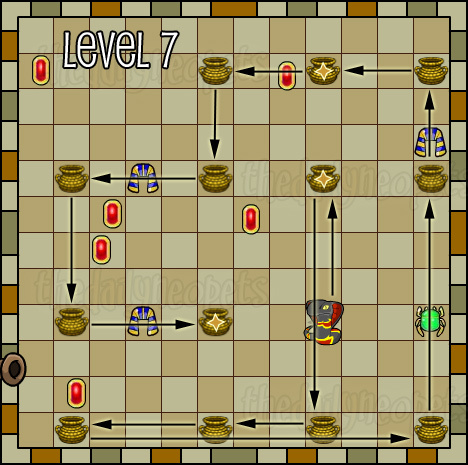 As the levels don't change, there are specific paths that can be taken to complete them each time. 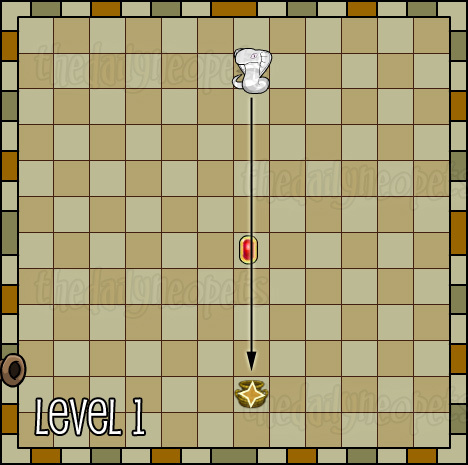 Please remember, the levels rotate so yours might look slightly different to these screenies. The path to completing them remains the same however, you'll just need to mentally turn the screenie around so it lines up with your game. There are, of course, other ways to complete the later levels - for these screenies I've tried to pick out the path that will yield the most points from the 4x multipliers and the Star Bonuses. The Snowager is awake. He'll be sleeping in 1 hour, 52 minutes.